Just over a year ago I blogged a simple way to add an authorization header to your swagger-ui with Swashbuckle. Although that works, Swagger-UI and Swashbuckle support a better way, which I’ll describe below. Before starting I assume you’ve already got OAuth2 setup correctly on your application (using bearer tokens), and you have decorated your controllers and actions with [Authorize] attributes. If you haven’t, that is beyond the scope of this blog post. Here all I’m doing is explaining how to configure Swashbuckle. You can either download the SecurityRequirementsOperationFilter from here, or, if you’re using ASP.NET Core you can install my Swashbuckle.AspNetCore.Filters package from NuGet, which includes it (and other filters). Once you’ve done that, when you “Try it out” using the Swagger-UI, the authorization header with your bearer token should be sent to your API. I am getting “Fetch error Internal Server Error v1/swagger.json” after adding options.OperationFilter(); Is there anything special that needs to be added anywhere else in the application? Do you perhaps have a working example project? I don’t understand your question, sorry. Where does the bearer token come from? Normally in web apis the bearer token will come from an external identity system. Thanks! 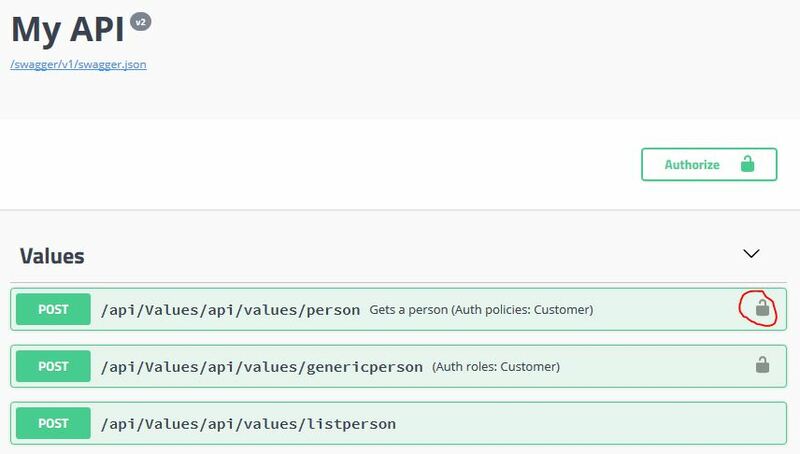 This really helped me get started with implementing authorization into our existing REST API. On my back end, I haven’t implemented or used OAuth2. It’s not what I’m interested into right now but I want to make my clients send a key to the back-end as a sort of security mechanism. It’s still in development phase. I just need to be able to send a key-value pair on the headers with the Swagger interface, as I would do it with Postman for instance. How can I achieve this? Hi Sebastian, yes, that can be done, I’ve already written a Swashbuckle filter which will do that for you. Are you using ASP.NET Core? Check out my Swashbuckle.AspNetcore.Filters package on GitHub. Or Swashbuckle.Examples if you’re using .NET Framework. See the “Add a request header” section of the readme. Yes, I’m developing on ASP.NET Core. I have a very simple Middleware that now is able to check that a Key is being sent. In the future, I might add OAuth2 but for the current phase, this is just fine. Is there a way to add a “default’ value to the “value” textbox in the authorization popup? I haven’t tried it, but the steps should be the very similar. Except you will need to copy the SecurityRequirementsOperationFilter from here https://github.com/domaindrivendev/Swashbuckle.AspNetCore/blob/master/test/WebSites/OAuth2Integration/ResourceServer/Swagger/SecurityRequirementsOperationFilter.cs and add it to your solution. You will need to convert it from a Swashbuckle.AspNetCore filter to a Swashbuckle filter (which is very easy and should only take a few minutes – just get it to compile and it should work). Do you know how can I get the token first? On my web api I need to acces http://mysite/token passing username, password and grant_type. Then I receive the token, and this token should be passed in all requests. Is there a way to do that? I am trying to do this, but in asp.net (full framework, not core), and I just don’t find any of the above code. Are there any examples in non .net core on how to do this as well? I haven’t tried it, but I think the steps should be very similar. I’ve been trying to get this to work for 2 days now. I cannot get “BASIC” authentication working. We want to use “BASIC” when doing testing integration. Any ideas why BASIC won’t work? Basic authentication is different, and you probably won’t need my library to do it. No, that doesn’t work either. It seems as if Swagger just doesn’t work with authentication at all? I am using AspNetCore 2.2 project. @Tim I can’t help you I’m sorry. The code snippet I posted for you above works for me, we are using basic auth at work so I copied it from a working solution. All swagger does is document what your API does, it does not do the basic authentication for you (if that’s what you’re thinking). Here at work we are using the Bazinga.AspNetCore.Authentication.Basic NuGet package to do the basic authentication. Hi Matt, no problem. I find it odd that BASIC auth works fine for me from Postman, just not Swagger. I can see through Fiddler that none of the auth headers are being sent back, but other headers are (ex. pageSize, pageNumber, etc.) for some methods. May I ask what else you’ve enabled besides just the standard auth pipelines (ex. services.AddAuthentication(…), app.UseAuthentication(), etc.)? Tim – I have a whole bunch of other stuff enabled but the code I posted above is all that you should need for basic auth. Do you see a padlock next to your actions as per the screenshots in my blog post? When you click the padlock, do you get a username and password prompt? I finally figured it out. It dawned on me that the “app.UseAuthorization” was being called AFTER enabling swagger, this needed to be before it.